Review in a Nutshell: The Darkest Star is a really fun, enjoyable read. It does have some issues, but I couldn’t help but love this book. 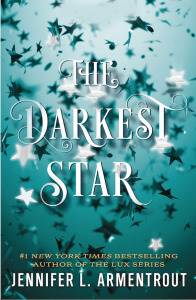 The Darkest Star is a spin-off series to Jennifer L. Armentrout’s amazing Lux series, focusing more on the character Luc, but following an entirely new protagonist. Evie is the daughter of James Dasher, who has been killed when the Luxen, a race of aliens, invaded Earth four years ago. When Evie meets Luc, she gets pulled into the world of aliens and government conspiracies. However, he is keeping secrets from her that have the power to change her life, and she must decide who she can trust. I really loved the aliens and universe built in the Lux series, and this book expands on some of the things introduced there. If you wondered what happened after the events of Opposition, The Darkest Star answers a lot of those questions. What do we do after the alien invasion? How do we move on? The setting also allows for some commentary on illegal immigration, which is a nice bonus, but it definitely isn’t explored deeply. It serves more as icing on the cake that hopefully will get a larger role in the sequel. Jennifer L. Armentrout’s writing style is really fluffy and fun. She writes a lot of entertaining, witty banter, but her dialogue can get a little too cheesy at times. That said, it makes for a really quick and light read that you can easily finish in one sitting. The pacing of this book was fast, partially due to the writing style but also due to plenty of action scenes and tense moments. The mystery aspect of the plot was interesting but definitely isn’t the main focus. Most of the plot revolves around Evie and Luc’s relationship. There were a few interesting twists, but the main one was definitely predictable. However, it was still fun and I was happy to see my prediction come true. Honestly, it’s best not to go into this book expecting too much. It’s interesting and fun, but you need to love it for what it is. A cute and entertaining sci-fi romance. I loved seeing a new side of Luc in this book. His character was definitely my favorite aspect. I found him really interesting in the original series, and even more interesting now. Evie was also a good protagonist, but she wasn’t my absolute favorite. The side characters were fairly interesting, and there was some LGBT representation, so overall I was happy. There were some cameos and mentions of all my favorite characters from the original series, so that was a nice happy bit of nostalgia. The Darkest Star is an entertaining book that will put a smile on your face and make you love it despite its flaws.